Wrapping up a week in which it seems I can’t stop talking about Amish food (Amish bulk food stores, Amish canning, Amish maple syrup) I was happily surprised to find a new article on Indiana Amish food markets in the Chicago Tribune (see Indiana Amish food markets). When I hear “Amish markets” I tend to think of the PA Dutch farmers’ markets you see in urban and suburban areas, mainly run by Lancaster Amish on the Eastern Seaboard (in the areas of DC, Philly, Baltimore and other places). The markets in the Tribune article are more the local stores found in Amish areas, in this case the Indiana Amish communities of Elkhart/Lagrange Counties (Shipshewana area) and Allen County (Grabill). The Amish stores mentioned in the piece are E & S Sales and Rise ‘n’ Roll Bakery in the Elkhart-Lagrange Amish community (though I think Rise ‘n’ Roll is no longer Amish-owned but Amish-staffed), and Grabill Country Sales and Schmucker’s Produce Farm and Greenhouse in the Allen County Amish community. Anyone been to these? I’ve been to Rise ‘n’ Roll and I believe Schmucker’s (they start to blur together 🙂 ). The Chupps family’s E&S Sales at 1265 N. Indiana 5 in Shipshewana has nearly doubled the size of the store recently. 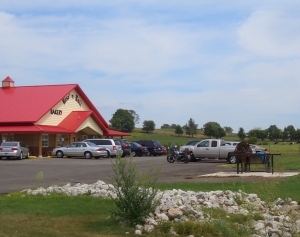 Most days, this granddaddy of Amish groceries has a long line of buggies and patient horses parked outside, as well as a parking lot full of cars. The market now includes an ice cream shop and fresh produce along with a huge assortment of staples – including bulk flours and other baking needs, rices, grains, nuts, dried fruits, candies, unusual cheeses, soup mixes, canned goods, herbs, spices, flavorings and even cleaning supplies. I’m not sure how many “classic” PA Dutch markets–I’m meaning the urban kind with mixed vendors–can be found in Indiana cities; I believe I read of one in Chicago but haven’t heard of any in-state. That probably reflects the greater distance to high population areas (as well as other occupational opportunities available to Amish) though it still seems feasible. If you know of any Indiana urban or suburban Amish markets let us know. As an aside I guess I’ve had Amish food on the brain lately since I’ll be traveling to Amish Pennsylvania in a week or so. I’m mentally preparing, kind of like a surgeon before operating or an athlete before the big game. That, and I’ve actually been thinking lately about our national obsession with food–this week I discovered there is a reality show based on baking gourmet cupcakes for a panel of judges(! )–but I guess that’s a topic for another time. Indiana Amish edibles have had a good run lately. A year ago we discussed Middlebury’s Rise ‘n’ Roll Bakery & Deli producing “Gourmet” Amish Apple Butter for the upscale Dean and Deluca company. So it looks like Indiana Amish food continues to be on the upswing and three cheers for that. And with that we officially bring Amish America Food Week to an end (though for how long I can’t say). I sure wish we had Amish food vendors up here. One grocery store one town over has “imported” bakery goods from various well-known Chicago bakeries but I haven’t seen anything Amish amongst their baked goods. Sometimes I see Amish noodles,, though. I once ordered (2-3 years ago) some food items from a bakery (?) in Arthur. I know the shipping was outrageous, but it was cheaper than a trip there. I picked the cheapest shipping (expecting to get it within a week or longer) and was pleasantly surprised to get it two days later—delicious rhubarb-cranberry bread! I also bought my first Amish “peanut butter” spread. The preserves/apple butter (sugar free) were yummy. But ordering baked goods by mail isn’t cheap, so I haven’t done it again. However, with the subject matter of late on this blog (Amish food) thanks to you, Erik, I might just have to place an order again soon! Alice Mary I am semi-surprised there aren’t more PA Dutch type market places in Chicago area but it probably is just a little too far out of range for a market commute even from the Northern Indiana Amish settlements. Erik, you MUST stop reminding me of all of my favorite “food” places in Shipshewana and Middlebury, Indiana! It’s snowing here in Grand Rapids, Michigan, and I can’t drive down there to my favorite places. I love E & S Sales! A trip to Shipshe is not complete without a stop there. They have expanded the store to at least double the size now, and I can’t wait to get there and check it out. They were still working on it when I was there last. Thanks for all of your wonderful posts regarding Amish America. I love this site and read it every day. I have found 2 amish sites to order amish food from if you are interested – Lehmans.com and essenhaus.com Both have quite a selection. Hope this helps. Pick me up some potato chips from the great state of Pennsylvania while your up there. I grew up near Lancaster. It’s the chips and pretzels I miss the most. North Carolina just can’t do it right. Hi Erik! I live near Grabill and go to Grabill Country Sales on a regular basis. VERY similar to a bulk goods store in the Lagrange settlement but I can’t remember the name. The Grabill store also has a bakery – the cinnamon rolls are the best! Their bread is amazing of course. I have not been to Schmucker’s Produce Farm but will have to go. There is also another Amish bulk goods store in Grabill that I don’t know the name of. In addition to bulk goods they sell fabric, notions, clothing, shoes, housewares, and some large appliances. To get there, go over the train tracks and take your first right. Store is in a small white building near the end of the road. Glad to hear more about Grabill Celeste. In my opinion this is one of the more unique Amish areas. Lot of businesspeople but a lot of them are in the building trades and there aren’t the same number of shops and public businesses as in some other large communities. So I was glad to hear about these. I’ve been to a couple dry goods shops here in addition to the food places; there are a few at home businesses but it is just not as common as in other Indiana communities. I remember seeing an E & S store in Minn. but never went in. Driving by I thought it was a cattle store. To bad I didn’t take a chance and go in. now I’ll have to go back to the ones mentioned. how much technology can be used in stores. Al the Ordnung generally would influence what’s permitted in Amish-owned stores. Something about a loudspeaker in an Amish store seems a little off doesn’t it! Not going to see (hear) that in the Ethridge TN Amish settlement for instance. You do have some Amish stores with electric, but the building would be rented not owned in most cases. The PA Dutch Markets are an obvious example of that. Al in Ky., you are absolutely right about the Amish stores not being the same once they grow and expand. For example, I’m actually dreading what the Centerville Bulk Foods store in Gordonville, PA, will look like once they are finished with remodeling it, which will be sometime in April, I believe. It used to be this neat little store out in the middle of the farms with very limited parking, but you were always assured of seeing plenty of Amish and their buggies coming in and out. And they kept the shopping carts outside which was always awkward trying to get one through the non-automated, heavy doors, and then maneuvering it around the little, crowded aisles. And there was only one long wooden check-out counter with a very nice and friendly Amish woman behind it, and sometimes the line could get really long, too. But these are the little nuances that made the place neat and unique, and probably kept the prices down, as well. Now, with the remodel, I’m afraid all the charm and uniqueness will probably go out the window, in favor of more space and convenience. I’ve posted on this site before. My son, Mark, is a member of the Belle Center,Ohio Amish community. Troyer’s have a nice general store just south of Milroy, In. on the west side of SR3. The last time I was there which was this fall, they were building on to the original building. 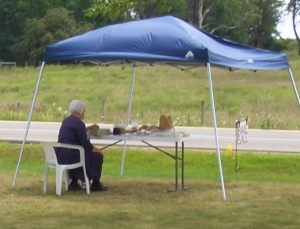 Mary Troyer sells her home made baked goods on Fri & Sat. The price on their cheeses is very reasonable also.